In mid October 2016 a sapphire rush developed east of Ambatondrazaka, Madagascar in a theoretically protected area for conservation. About 45000 people had walked 12 hours into the jungle to dig for sapphires and I joined to find out exactly why. Each morning I woke to the noise of digging and cheers rising through the morning mist that hung above the valley. Pots and pans clunked together as cooks served the stable: rice, pot noodles and watery haricot beans or coffee and mofo gasy (circular shaped donuts) to hungry people. Miners, traders and brokers showed me stones they had found and traded: from “au vive” (a light swimming pool blue with good transparency) to a deep “royal blue”. Some stones had an uneven colour distribution blue/white, many were actually milky and some were “polychrome” meaning that they were several colours but usually contained lots of brown. Sapphire at the rush site near Ambatondrazaka, Madagascar. October 2016. 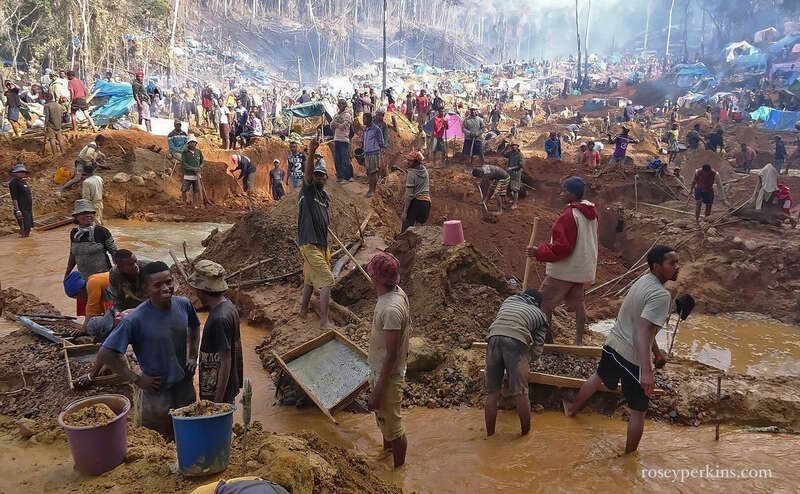 In the 3 days I spent there I didn’t see one sapphire taken directly from the sieve, although foreign traders were flying in to Madagascar having heard of fine +100 carat rough. To read a full account, which contains more details including photos of the stones and describes life at the mining site, please download the pdf by clicking the link above. Awesome to have seen such a thing first hand! Overwhelming to the eye at first…Thanks for reading! Incredible story. I live in Toamasina (Tamatave). On a recent trip to Ankarana National Park near Antsiranana (Diego Suarez), I drove through Ambondromifehy and my driver told me about the sapphire mining there. Interesting side note to my trip. Now I read your story. Wow! Thanks for documenting. Maybe I’ll go out there at least as far as Ambatondrazaka just to get a feel for what’s going on there. And yes, like what the law student was saying and bribes required to get his degree, finding a sapphire would be a life changer for people here. Thus the city of people going into the jungle to mine. Thanks for reading Brett, yes I think this small scale mining is a fairly simple “quick fix” idea to the Malagasy people but complex problems for the conservationists. I think the mine site is still operating at the moment, though that may change. nice reporting Rosey. an unusual experience indeed. peace on the trail………………………..
Just wow. Sounds so exotic, indiana jones x hideous, unsightly. 180° degrees from my suburban life. ? 180 degrees from mine too. It’s strange and interesting to still be talking to some of the miners I met there via facebook from London. Insightful conversations, this story continues..Thanks for reading. Hi Rosey – amazing work reporting this – can you advise whether all of this mining involved cutting forest, or was it a mix of existing clearings and new cutting? Do you have information on the dimensions of the affected area/s, to get a handle on how many hectares have so far been impacted? Where is the deforestation trending? N, S? Thanks, Andrew Cooke. Hi Andrew, Sorry for not replying to your comment before. On my way to the mine site I saw 3 areas which had been worked by gold miners and in one stream there was an iridescent film, and it looked like gold filings or something from the extraction process at the bottom of the streamlets (maybe gold?!). I have photos. There were also 2 large tavvy areas and a village + house with arable land. I heard that the local people had known about the sapphires here for about 15 years but that some large stones were found after the mine had been cleared by gold prospectors who heard the sound of exploding stones. The main clearing was perhaps 500m in length though at first I estimated 800m (I’m not used to estimating distance!). There were several fires for clearing I think because the miners had extended into the jungle at either end of the main clearing. However, where they were digging at the southern end had bush which was about 5ft high and I estimate that was nearly 1km long. That’s what the Gendarme told me but I can’t be sure because I didn’t walk that far. When I left, people were chopping down the forrest to build tent frames and to remove some trees for mining (though I heard people commenting that that that definitely not allowed). I estimate 1000 people arriving the day I left. I also saw 3 goat herders taking meat to the miners and along the path, and where 4 days earlier there had been nothing just jungle there were 10 stalls selling refreshments for miners concentrated near Ansevabe. I picked up more litter than I could carry in less than 5 minutes of collecting litter on my way back from the mine site. We also passed some “Environment Officers” from the Government, my guide told me. The deforestation is in the North mostly, just because that’s where the largest sapphires are found and that’s where it is most cramped. The clearing was full, new people were struggling to find space and I’m confident they will have extended down the valley in both directions as well. I believed that 2.5km of the valley’s length had been affected while I was there but by now what would have multiplied. Please feel free to call me with more questions once you are back in UK: 07881229355. Next PostVisit to Sapphire Rush East of Ambatondrazaka, Madagascar.